The line-up of contenders for the presidency of the Asian Football Confederation (AFC), promises everything but the wind of reform and change the group badly needs after almost two years of controversy and scandal that are still reverberating through the world of soccer. With five days left to the March 3 deadline by which candidates have to announce themselves, the list of contenders so far reads like a cast of characters from a B-movie. In many ways, the line-up reflects a scandal-ridden world of questionable governance in global soccer in which officials project themselves as proponents of change, albeit change that does not fundamentally rock their comfortable boat. The 46-member AFC is scheduled to elect its new president at an extraordinary congress on May 2 following the banning for life from involvement in professional soccer late last year by world soccer body FIFA of Mohammed Bin Hammam, the AFC’s most recent elected head. Three of the five contenders - Yousef Al Serkal of the United Arab Emirates, Worawi Makdudi of Thailand and Hafez Al Medlej of Saudi Arabia -- are all associates of Mr. Bin Hammam. The Qatari national was accused of multiple conflicts of interest and financial mismanagement of the AFC. Mr. Serkal's hiring last year of two former AFC employees associated with Mr. Bin Hammam's controversial at best financial management of the AFC holds out little promise for a real break with the past. As head of the AFC marketing committee, Mr. Al Medlej was not only a Bin Hammam associate but also involved in a $1 billion commercial rights agreement with Singapore-based World Sport Group (WSG) that was questioned by an internal audit of the group conducted by PricewaterhouseCoopers (PwC). PwC raised questions about the propriety of the negotiation of the agreement as well as its terms and advised the AFC to explore the possibility of renegotiating or even cancelling the agreement. The fourth candidate, Sheikh Salman bin Ebrahim Al Khalifa, head of the Bahrain Football Association, was narrowly defeated four years ago by Mr. Bin Hammam in his bid for a seat on the FIFA executive committee. World Football Insider characterized the bitter battle between the two men as dominated by personal attacks, power abuse claims and cash bribes for votes. Of the five candidates, Acting AFC chairman Zhang Jilong is the only one who has sought to introduce a degree of change within the AFC. Critics say Mr. Zhang was restricted in his ability to challenge Mr. Bin Hammam's influence even after he was first suspended in the early summer of 2011 because of the fact that he had headed the AFC's finance committee during the Qatari national's presidency. Reformers within the AFC hope to turn the need for candidates to project themselves as agents of a clean break by demanding that they put forward a program that encapsules their vision for the group's future. The West Asian Football Federation (WAFF) that groups the AFC's Middle Eastern associations announced this week that it would vote for the candidate whose program best served soccer in the region. In response, Sheikh Salman has drafted a seven-point program entitled United for Change, according to World Football Insider, that pledges to fight match-fixing, doping and illegal betting; ensure full financial transparency by introducing international accounting standards and externally audit yearly reports; and guarantee equality in the distribution of AFC commercial revenues. The reformers’ hope that the programs will allow them to hold whoever gets elected to their word could prove easier said than done. The new president will chair an existing executive committee whose majority has so far been more inclined to delay rather than introduce real change. One litmus test, with most candidates likely to promise financial transparency, will be whether the new president acts on the PwC recommendations or at least initiates a thorough investigation of the group's finances and commercial dealings. That would involve revisiting the WSG contract that according to PwC may have been undervalued. PwC stopped short of drawing conclusions about the propriety of the agreement but suggested there were grounds for a review that include payments to Mr. Bin Hammam totaling $14 million by a WSG shareholder in the walk-up to the signing of the contract. Sources say pressure on the new president to follow through is compounded by continued inquiries into Mr. Bin Hammam’s management of the AFC by FIFA ethics investigator Michael J. Garcia. WSG started last year legal proceeeding against syndicated columnist and author of this blog, James M. Dorsey, in a bid to force him to reveal his sources. The bid is designed to squash reporting and intimidate sources. A Singapore court, in a landmark decision earlier this week, granted Mr. Dorsey the right to appeal an earlier court ruling instructing him to disclose sources. WSG’s performance is already under scrutiny within the AFC with some of the group’s members insisting that it service a broader swath of Asian matches that are not necessarily among those that are commercially most lucrative. The push is part of a larger effort to broaden participation in the AFC’s Champion League to ensure that all members reap the benefits of commercialization. When militant supporters of right-wing soccer club Beitar Jerusalem last month vowed to keep their team pure in protest against the hiring of two Chechen Muslim players they went beyond what are usually accepted expressions of racism in Israel to unwittingly challenge a founding principle of Israeli foreign and defense policy coined by the country’s first prime minister, David Ben Gurion: the need to ally Israel with non-Arab Muslim nations to compensate historically for the lack of and more recently uncertainty of its relations with Arab neighbors. In doing so, they provoked a rare national outcry against the club’s racist policy – Beitar Jerusalem is the only top league club to have never hired a Palestinian player despite the fact that Palestinians rank among the country’s top performers – that in many ways reflected last month’s outcome of national elections and a growing awareness that Israeli policies are alienating even its closest allies. Prime Minister Benjamin Netanyahu’s Likud party emerged narrowly as the winner from an election that showed Israel deeply divided between the right and the left. In an illustration of Beitar’s importance to the Israeli right, two right-wing Israeli parliamentarians, Michael Ben-Ari, a former member of assassinated right-wing rabbi Meir Kahana, and Aryeh Eldad of Otzma L’Israel, attended a Beitar match on the eve of the elections in a bid to garner suoppert. The outcry nevertheless included denunciations by Mr. Netanyahu himself, like many right-wing Israeli leaders, a staunch supporter of Beitar, the storied bad boy of Israeli soccer. It also reflected however unease among significant segments of Israeli public opinion with their country’s increasing isolation sparked by controversy over Israel’s settlement policy; mounting criticism of the treatment of prisoners, including last year’s release of a hunger striking Palestinian national soccer team player as a result of international pressure; and the rupture in relations with Turkey in the wake of the killing of nine Turks aboard the Mavi Marmara as it sought to break Israel’s sea blockade of the Gaza Strip. The prisoner issue threatened this weekend to explode with thousands of Palestinian prisoners staging a 24-hour hunger strike and hundreds of Palestinians demonstrating in the wake of the death of a 30-year year old Palestinian arrested on charges of stone-throwing while he was in Israeli custody. Palestinian officials warned that the prisoner’s death could be the spark that ignites the powder keg of discontent on the West Bank and in the Gaza Strip. Conditions in Israeli prisons have further undermined Israel’s relations with its staunch ally Australia, already strained by the use in 2010 of Australian passports by Israeli agents believed to have been responsible for the killing of a Hamas operative in Dubai, after news leaked earlier this month of the death in Israeli custody of an Australian national, Ben Zygier. Mr. Zygier reportedly was an operative of Mossad, the Israeli intelligence service, who allegedly was on the verge of revealing details of Israel’s use of foreign passports in its covert operations. Australia, in an unprecedented break with past unrestricted support of Israel, last year joined 26 of the 27 members of the European Union who either voted in favor or abstained from voting for a United Nations General Assembly resolution recognizing Palestinian statehood. “In a world so interconnected and interdependent, Israel cannot afford to lose the international legitimacy that flows from a readiness to make peace. There are myriad obstacles to an agreement with the Palestinians – many of them on the Palestinian side. But Mr. Netanyahu has redefined the issue in international opinion as one essentially of Israeli intransigence,” said columnist Philip Stephens in this weekend’s Financial Times. The current outcry stems from the fact that a militant segment of Beitar’s supporters rejected the club’s hiring of two non-Arab Muslim players, who moreover hail from a region that Mr. Ben Gurion would have defined as part of the non-Arab Muslim periphery, which Israel has always sought to engage. It comes amid growing concern in Israel about mounting soccer violence that is not always related to Israel’s dispute with the Arab and much of the Muslim world. The outcry over racism expressed towards the two Chechen players contrasts starkly with the lack of a national response to past outbursts by militant fans, including an attack on Palestinian shoppers and workers in a Jerusalem mall as well as Jewish musician who denounced their attitudes and Beitar’s refusal to hire Palestinian striker Mohammed Ghadir who in late 2011 volunteered to join the club in a challenge to its anti-Palestinian policy. Despite the fact that the militant fans’ language and symbolism at times is reminiscent of that of the Third Reich – fans unfurled a banner with their demand to keep their club pure that was reminiscent of those employed by the Nazis – Beitar until recently defended rather than condemned its most extreme supporters. The long overdue outcry is moreover itself not free of racial attitudes. Mr. Peres’ appeal however hit deaf ears within Beitar. While the club’s owner, Russian-born Arkady Gaydamak, echoed the president’s remarks, Beitar coach Eli Cohen drew a distinction between Arabs and Muslim in a perversion of Mr. Ben Gurion’s principle. "I don't understand the fans who don't want to see a Muslim player in Beitar. There are a billion Muslims in the world and we must learn how to live with them. There is a difference between a European Muslim and an Arab Muslim, and the fans here have a problem with Arabs living in the Middle East,” Mr. Cohen.said. The club’s spokesman, Assaf Shaked, went as far as explicitly defending its anti-Arab policy. “We are against racism and against violence and we pay a price for our fans. But we aren’t going to bring an Arab player just to annoy the fans,” Mr. Shaked said. The row over Beitar’s racism goes to the heart of Israel’s increasingly troubled international relations, an increasing sense that it bears substantial albeit not sole responsibility for the failure so far of the Israeli-Palestinian peace process and its strained formal and informal relations with a majority of the Arab world. Israel’s strength no doubt is its ability to discuss such issues publicly. The question is whether this debate will spark the necessary soul-searching. Military troops are protecting factories and government offices on the fifth day of a general strike in the Suez Canal city of Port Said that has brought together two groups with working class roots that played key roles in the toppling of former Egyptian president Hosni Mubarak: militant, highly politicized, street-battled hardened soccer fans and the labor movement. Operating independently both groups constituted key centers of resistance to the repression of Mr. Mubarak’s regime during the years that preceded his downfall. The fans fought police and security forces in the stadiums in a battle for control of one of the country’s most crucial public spaces while workers in industrial towns like Mahalla organized strikes against Mr. Mubarak’s economic liberalization policy and corrupt and nepotistic privatization of state-owned assets. Yet, it took perceptions of a majority of the population of Port Said, a city of 600,000 historically on the frontline of Egypt’s many past confrontations with Israel but nevertheless economically neglected, that even under the country’s first democratically elected president they continued to be a convenient scapegoat, to bring fans and workers together. In doing so, Egyptian President Mohammed Morsi has failed where Mr. Mubarak succeeded: keeping powerful critics divided. Some 20,000 workers have joined the protests and a five-day old general strike in Port Said, according to Egypt’s state-owned Middle East News Agency. As a result, Mr. Morsi faces a serious challenge to his authority with protesters and strikers ignoring his declaration of emergency rule in the city and two other towns along the Suez Canal and the Red Sea, Suez and Ismailia that were focal points of anti-government demonstration. That defiance is likely to be fuelled in coming in weeks as Egypt anticipates a second round of verdicts on March 9 in the trial against 52 defendants who include officials of Port Said’s Al Masri soccer club as well nine mid-level police and security officials accused of responsibility for the death a year ago of 74 supporters of crowned Cairo club Al Ahly SC in a politically loaded brawl. Mr. Morsi’s predicament is his own making even if he inherited the explosive political baggage embedded in the Port Said trial from the military that led Egypt’s from Mr. Mubarak fall to the Muslim Brother’s electoral victory. His failure to initiate crucial albeit difficult reform of the overriding symbol of the Mubarak regime’s repression, the police and security forces, is compounded by the fact that they remain a power onto themselves able to continue their Mubarak era practices of hard-handed management of public protests, arbitrary arrests and torture. Adding insult to injury is the fact that police and security officials have yet to be held accountable for the deaths of more than 800 protesters since demonstrations against Mr. Mubarak first erupted in January 2011. Public anger has been further fuelled by the fact that none of the security and police officials in the Port Said trial were among the first batch of those convicted despite a prosecutor’s report that put equal blame on law enforcement and Al Masri fans as well as the fact that 32 protesters were killed in Port Said during protests on the day that the court announced the death sentences against the Al Masri supporters. Mr. Morsi’s attempt this week to counter Port Said’s sense of being ignored with proposed legislation to reopen a lucrative free trade zone in the city and allocate some $60 million to economic development in Port Said, Suez and Ismailia was rejected by protesters as too little too late. The protesters say they are steadfast in their demand for justice for the protesters who were killed. The deep-seated animosity towards the police and security forces is rooted in years of confrontation with fans in the stadiums in what amounted to a battle of control for public space and in factories where workers asserted their rights as well as in the fact that police and security officials were the ones that made life difficult in popular neighborhoods of Egyptian cities. The resulting popular anger may well have boiled over in Port Said on the day of the sentencing of the Al Masri fans with witnesses reporting that two policemen were the first to die on the city’s streets. That notwithstanding, calm badly needed to halt Egypt’s economic slide and return it to economic growth, is unlikely to be restored as long as Mr. Morsi fails to initiate reform of the police and security forces, a major bastion of the former regime. The president’s failure to do so is compounded by his haughty style of government and his failure to consult opposition forces on controversial moves such as the rushing through of a constitution perceived by many as strengthening the hand of Islamists and potentially curbing fundamental freedoms. 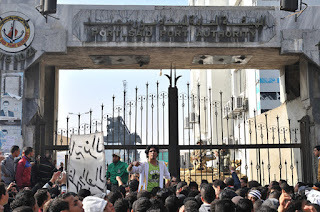 The bringing together of workers and fans in a consorted protest against the Morsi government that has all but paralyzed Port Said heightens the risk that traffic through the Suez Canal, a major source of badly needed revenue for the government, could ultimately be affected. The protests have already prompted the evacuation of the Suez Canal authority’s headquarters as well as the closure of more than 20 factories that are now guarded by the military as fans, workers and government employees demand Mr. Morsi’s resignation. Protesters this week temporarily blocked the road leading to the entrance of the Canal. They were joined by workers of the Canal’s container terminal. Militant soccer fans first reached out to the workers’ movement during protests a year ago in the wake of the Port Said brawl by acknowledging in a song that workers were among those who lost their lives in Egypt’s popular revolt. It never went however beyond the symbolic stretching out of a hand. Port Said may well constitute the basis for real cooperation rather than symbolism. If so, Mr. Morsi will have not only paved the way for the emergence of an activist coalition that has got its feet wet not in using a computer to employ social media but in hard fought battles in which they have proven themselves as formidable, fearless opponents, but will have also further complicated his efforts to restore calm and open the door to economic development without embarking on real political, social and economic reform. Said a leader of Ultras Ahlawy, the militant Al Ahli support group, in an interview with Egypt’s Al Ahram newspaper: "Our fight for justice is ongoing and will escalate until all members of the police or military who abused the Ultras are put on trial. We will not give up our rights that easily. We will escalate if needed, as was seen in our 26 January protests commemorating the second anniversary of the 25 January Revolution." Opposition groups expressed support for the Port Said protests. The Popular Current group, one Egypt’s major opposition groups, described them as "part of the popular anger" against Mr. Morsi. "What is happening in Port Said is a legitimate right in the face of an authority that has adopted repression and tyranny," the group said in a statement. “You got shook and shook till there was nothing left. You lost your name and your body and your self and you just didn’t care,” Alex says in describing his violent binges. Burgess’s novel — ­popularized in a 1971 film by Stanley Kubrick, starring Malcolm McDowell as the malevolent Alex — is worth a new look. It’s an eerily prescient guide to the youth gangs that are wild in the streets of Egypt and other countries. What are these hooligans telling us about the future — not just in Egypt but also in other nations where authoritarian leaders have lost their power to repress dissent by angry young men? The teenage marauders seem to have lost respect for the world of their fathers — and for the forces of social control that were woven through traditional societies such as Egypt. The old social fabric has ripped. The young gangs who own the streets are contemptuous of police and most other authority figures. If the Egyptian government orders a curfew, the soccer thugs make a point of staying out all night. They seem to disrespect their fathers’ generation for having sacrificed their dignity by submitting to President Hosni Mubarak’s soulless, repressive regime. 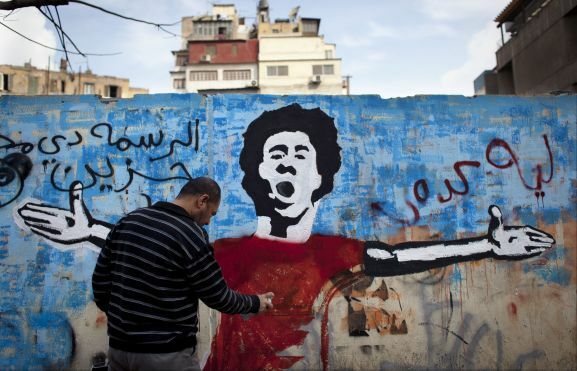 The Egyptian soccer thugs are known as “ultras,” a term Burgess would have liked, and they play a growing political role. They helped overthrow Mubarak two years ago in Tahrir Square. Now, styling themselves as the “Black Bloc,” they are challenging Mubarak’s successor, President Mohamed Morsi, and his Muslim Brotherhood government. Analysts theorize that the soccer thugs were allowed to take root under Mubarak because they offered a nonpolitical way for young men to vent their anger — outside the mosque and outside opposition politics. But the gangs of violent youths became shock troops of the uprising that toppled Mubarak’s regime. They helped prevent the security forces from sweeping the square in the revolution’s fragile early days. James Dorsey, a journalist and academic who writes a blog called “The Turbulent World of Middle East Soccer,” explains the rise of the ultras. After years of battling Egyptian police in the soccer stadiums, “they were fearless, they had nothing to lose, and they became battle-hardened,” he told Foreign Policy. Egypt’s post-revolutionary challenge has been getting these angry youths to join in building a new democratic system. This same problem is evident in other Arab Spring hotspots, such as Tunisia and Libya, which are proving fractious and difficult to govern. In Egypt (a society with a deep love of order), the instability has been acute: A year ago, a soccer riot in Port Said killed 74 people. Last month, more than 30 were killed as soccer riots erupted in Suez, Alexandria, Cairo and Port Said. Morsi seemed close to losing control until the military sent in troops to protect key facilities. The problem, Dorsey told Foreign Policy, is “how to make the transition from street to system.” This hasn’t happened in Egypt or Libya and has only begun in Tunisia. The revolt of alienated soccer youths is hardly confined to North Africa. In Israel, a soccer team called Beitar Jerusalem is supported by racist young fans who chant “Death to the Arabs” and recently unfurled a banner that proclaimed “Beitar Pure Forever” to express their opposition to recruiting Muslim players. “When talking about Beitar, it’s actually showing a mirror for Israeli society,” Nidal Othman, director of the Coalition Against Racism in Israel, told the New York Times. Soccer hooliganism is endemic, as well, in Britain and many other European nations. Racist chants can be heard on soccer pitches across the continent. In his 2004 book “How Soccer Explains the World,” Franklin Foer notes the paradox that hooligans and their violent tribalism continue even as soccer becomes globalized and interconnected. Soccer teams provide an intense bonding experience in societies where other connections have broken down. We can see this theme playing out in Egypt, as the kids who made the revolution refuse to settle down and take their seats. Like the Jacobins of revolutionary France, these “ultras” rule the streets, almost daring some future general to crack down. of former regimes or alleged Islamists. party that fears loss of power. stadiums to maintain law and order. security forces in a bid to halt what they see as an Islamist power grab. police and security forces, have done little to assuage anti-Islamist fears. secured in a post-Assad Syria. and are more focused on fending off threats and settling old scores. demonstrate that they can make that mental transition. manoeuvre the minefield that constitutes Egyptian transition politics. institutions and is focusing on a turnaround of the country’s economy. police as it did on spectators in the stadium. of Middle East Soccer blog. Qatar, in a bid to fend off a possible move to deprive it of the right to host the 2022 World Cup because of its failure to adopt international standards for foreign workers, is drafting a charter for laborers involved in the construction of infrastructure related to the tournament. The announcement of the planned charter by the Qatar 2022 Supreme Committee comes amid a rare series of articles in Qatari media depicting workers’ difficulties and a call to offer laborers relief in part through sports. It further follows a rare news conference in the Qatari capital Doha by Human Rights Watch in which it charged that the Gulf state had failed to live up to its promise to address the fundamental rights of foreign workers who account for about a third of the population in a country in which non-nationals are the majority as well as condemnatory statements by international trade union leaders. "We are currently in the final stages of drafting a migrant worker charter that will be implemented on all tournament-related projects. Our aim is for this charter to be completed and in place by the end of the first quarter of 2013. We have actively sought out concrete suggestions on best practices and are evaluating how those can be accomplished,” Qatar’s state-owned Al Jazeera television network quoted a committee statement as saying. Details of the planned charter were not immediately available. Nevertheless, while the charter is likely to involve improvements of the conditions of foreign workers, it is unlikely to satisfy demands by trade unions and human rights groups. For one, the committee’s authority does not stretch beyond issues involved in hosting the World Cup. As a result, it would only effect workers involved in World Cup-related projects unless it were to be adopted by the ministry of labor. Qatar has so far moved to enforce safety, security and health standards and improve living conditions, but has stopped short of meeting demands for a lifting of its sponsorship system that makes workers dependent on their employer and deprives them of their freedom of movement and ability to freely change jobs. It has also shied away from endorsing calls for the right to form independent trade unions and engage in collective bargaining. 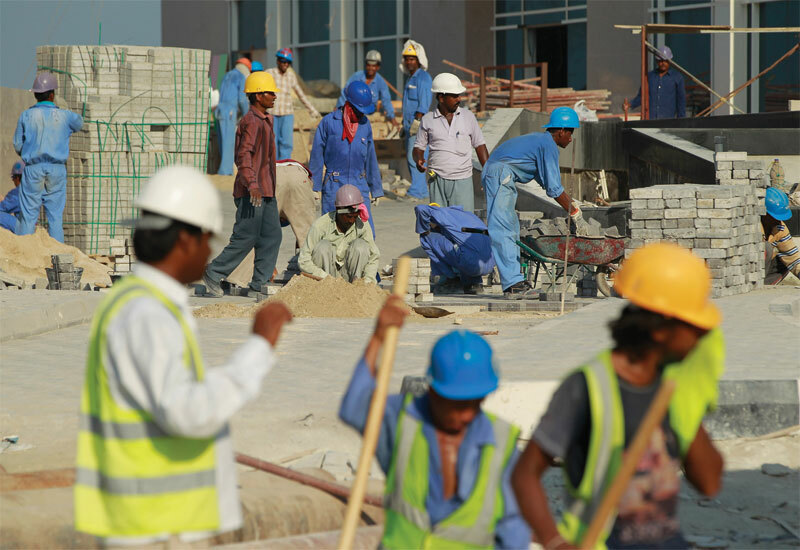 Qatari press reports said that the Cabinet had this week reviewed proposed new safety regulations for workers. In a possible breakthrough, labor minister Sultan bin Hassan advised International Trade Union Confederation (ITUC) secretary general Sharan Burrow last November that Qatar would not penalize workers who formed or joined an independent union. The ITUC with 175 million members in 153 countries has said it would put the minister’s words to the test later this year. It has threatened to launch a boycott campaign against the World Cup if Qatar fails to meet international labor standards. The planned charter, the improvement in material conditions and the domestic debate all illustrate that the trade unions and human rights groups have gained leverage with Qatar’s winning in December 2010 of the right to host the World Cup and are having an impact even if the response so far fails to address the structural and fundamental issues they have raised. The pressure on Qatar is in advance of an expected influx of up to one million additional workers to complete massive infrastructure projects many of which are unrelated to the World Cup although likely to benefit it. In addition, projections predict that construction costs in the coming years are likely to rise substantially. Nevertheless, labor issues that in the past remained unspoken of because they either risked opening the Pandora’s box of foreigners seeing their presence in Qatar as more than temporary or shed the Gulf state in a bad light are being publicly discussed. A series of articles in The Peninsula, a Qatari English-language newspaper, portrayed various aspects of the lives of migrant workers, including informal self-organized money pools that constitute a rudimentary social security system for workers and the lack of entertainment and relaxation opportunities as well as access to the Internet. Qatar University sociologist Kaltham Al Al-Ghanim noted that unskilled foreign workers were not included in the country’s National Strategy for Social Security (2011-16). “Isolating these large sections of our population can make them vulnerable to crime. They can be a challenge to social security,” she said. The newspaper noted that the lack of free-time opportunities had sparked the illegal sale of pirated CDs at Doha’s Al Ghanim bus station were workers congregate on Fridays, their day off, because there aree no facilities in the Industrial Zone where there camps are located. Qatar’s foremost pastime, a visit to the mall or a park, is often off limits because the conservative state seeks to limit entry of single men. To address the issue, Qatar is building in the Industrial Zone an entertainment and commercial center for foreign workers as well as a sports facility. In a break with the past, Ms. Al-Ghanim, called on the country’s sports clubs to set up branches in the Industrial Zone “to channel their energy to productive avenues and hunt for sporting talent.” Sports clubs in Qatar and elsewhere in the Gulf have largely targeted local nationals rather than foreigners for fear that identification with a sports club would give them a more permanent sense of belonging. The approach is one reason why stadiums in the region are relatively empty during matches. Ms. Al-Ghanim cautioned that if foreign workers were allowed to “live on the social fringes, the danger is they would take to illegal activities and emerge as a threat to social security.” She said the need to engage them socially was enhanced by the fact that many of them were unmarried or in Qatar without their families.